Design thinking is a method which is designers use in ideation and development. This is a methodology that solve problems. 5 steps in design thinking process. In design thinking empathy is “Understanding of people problems and realities of the people you are designing for”. 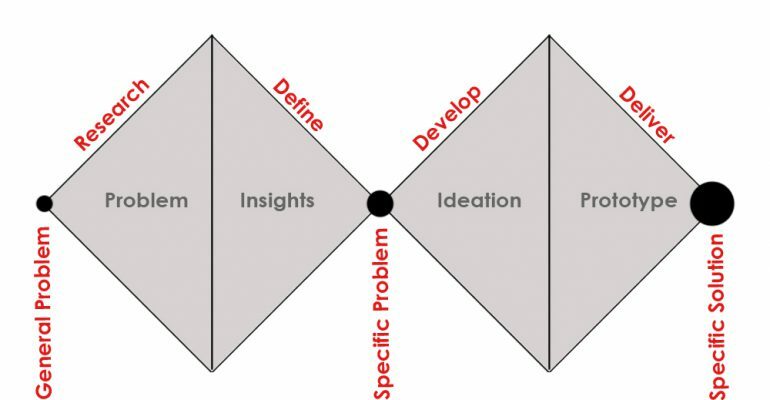 Learn how to solve about definition of your problem or design challenge it will surely improve your design thinking process and result. A great definition of problem will improve your team’s work and starts the ideation process with a right direction. This is a third stage of design thinking process. This is a creative process when designers generate their ideas in sessions. Before starting to look for ideas, team should know clearly about the problem. Focused on problem will be a great solution. There are many techniques to define your idea like a sketching, prototyping, brainstorming, any possible methods. This is a next step of design thinking. Prototype is the way of your problem solution. Designers Ideas are converts into life. Prototyping can be a quick and effective way of bringing your and your clients idea to life. To improve your idea create a prototype. It will help you to visual your idea. Get a quick methods of prototypes. Do not spent too much time to make designs in prototyping. Your ability to objectively judge its merits. Build prototype with the user in mind. This is a last stage of design thinking is “Testing”. Testing can be a undertaken throughout the process of a design thinking project. Testing in design thinking involves generatinguser feedback as related to the prototypes you have developed, as well as gaining a deeper understanding of your users. Once prototype has done let your users compare alternatives. Let your users experience prototype. Ask about their experience. Observe and follow up questions. The Design Thinking Process is fluid, iterative and flexible. When you know you’ve done a great job then product or service satisfies the three tests of desirability, feasibility, and viability.